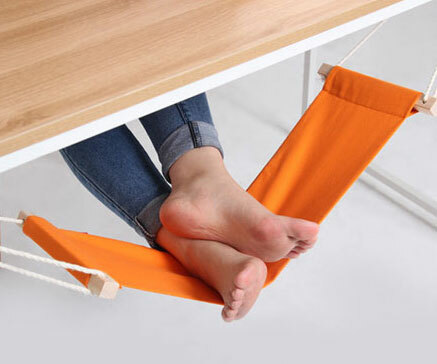 The Ultimate Office Accessory: The FUUT, A Foot Hammock | OhGizmo! Sitting at a chair in a tiny cubicle for hours on end isn’t how life is intended to be lived. But that’s how it is for a large chunk of the population. Every little thing you can do to make the process a little bit more comfortable is probably a good idea, and it’s especially so when it involves something like the FUUT, a Foot Rest Hammock. Tie it to the legs of your desk, and it’ll provide a soft elevated surface on which to rest your feet. Whether your boss will be ok with your little contraption is a different story, but it’ll cost you only $12.48 to find get your own and try your luck.